Andalucian City of Jaen, SpainIf we approach Jaen coming from the north of Spain, the province of Castilla, we can enter Andalucia through its main gateway. And the only Jaen passage way, like in many western films, is to squeeze through the rocky steep mountain path called Desfiladero de Despenaperros. 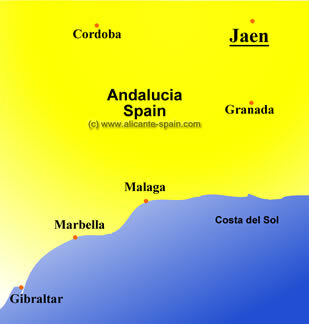 Common to all Andalucia, Jaen passed through the Romans and Phoenicians to continue on into the Muslim Domain. Jaen history took place in basically two important places: Las Navas de Tolosa, where the troops coming from Castilla, Aragon and Navarra joined forces to fight against the Arabs. In 1212, the Almohades, the Islamic dynasty which was ruling at this time in Andalucia, were defeated, making way for the rest of Andalucia to be conquered. Later on, from the 16 th century to the 18 th century, it had an important role in the Castillian government and in 1808, the city of BailEn was the stage where the bloody battle against Napoleon´s army, driving them off eternally. As all other Andalusian cities, Jaen was graciously favoured with the impressive and magestic Islamic architecture and culture which we can so well see today. 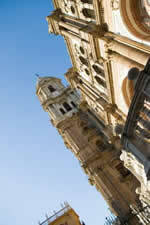 Jaen capital has magnificent monuments, museums and curious details to reveal to us. 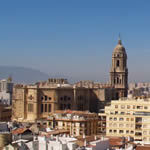 In the center town there is a beautiful Cathedral built between the 16 th century and 18 th century in Renaissance style. 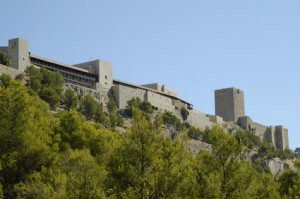 The stately, Moorish Castle of Santa Catalina is proudly set on top of Mount Catalina, today made into a Parador Hotel. Close to here, on another hill is a graceful cross with an inspirational poem engraved on it. It is highly recommended to go up and see this and the awesome view of Jaen unique landscape. There is never a lack of ornate or enriched churches such as Saint Andrew´s Holy Chapel La Santa Capilla de San AndrEs, the church of Saint Ildefonso, the Convent of Las Bernardas or the Church of Saint Bernadette surrounded by a quaint churchyard. Iberian art from Pre-Roman times are exhibited at Jaen´s Provincial Museum. As soon as we make the crossing through the Despenaperros mountain gorge, which is a very irregular, notched, rough mountain range separting Andalucia from the north of Spain, we come across a curious town called LaCarolina, founded by Carlos III as a new town in the 18 th century and mainly occupied by the Swiss. Its rectangular shape making up regular, symmetric little streets gives us the impression that it is a fortress. Coming down towards Jaen to the west, we have the pleasure of visiting Andújar, lying on the Guadalquivir river bed and which is one of the largest olive oil producers in Andalucia. The Church of Saint Mary possesses intricate wrought iron railings, Plateresque entrance, a Moorish style bell tower and a chapel with one of El Greco´s paintings showing in it. In the Natural Park of Andujar, there is an indescribable route to arrive at La Virgen de la Cabeza, a 13 th century hermitage which is often frequented by travellers pilgrimmingto this holy place in April. Back-tracking a little, we head over towards the east and discover Baeza, together with Ubeda. These two towns, hopelessly united, were the first to be re-conquered by the Christians following the famous battle at Las Navas de Tolosa. Baeza, airy although tiny, has a special leisurely atmosphere about it. The main square with its adjacent streets radiating from it like wheel spokes, has many relaxing, picturesque cafes so much a part of the social life. Renaissance mightiness can be seen everywhere as we approach the Square of the Lions. Being as this was the area where the Christians set out to re-conquer Andalucia, it is believed that from the curved balcony over the Tourist Information Office back then a glamorous mansion, the first religious ceremony was heard. The hypnotic palace of Jabalquinto , formally owned by a nobleman, nowadays used a seminary has much to show. The fascade is typical Isabelline style, not forgetting the Moorish characteristics. Quite near is a magnificent 16 th century Cathedral with its wrought iron railings. But even better is what is hidden inside. The painting of St. Peter conceals an enormous guardian angel and this can easily be revealed if you pay a small stipend. Saint Paul´s Church plays an important role during the festive days preceding the September 7 th religious procession that honours Our Most Holy Christ of the Ivy and the Virgen of Rossel. As most festivities are in Andalucia, there are special activities and always lively music and dance. The Old Market colonnade and the arcade of Barbudo are pretty. And do not forget to pay respects to Antonio Machado who taught at the university, loving called the twin of the Salamanca University as is the one in Ubeda. As just mentioned, Ubeda is very closely linked to Baeza, not only because of its closeness in distance but also because they profess loyalty to a strong Castillian influence. Both Ubeda and Baeza still show the Castillian seriousness visible in the granite stone buildings and squares. We are not used to seeing this style of architecture more common to the north of Madrid like Salamanca or Avila . We are used to seeing more unworried and luminous little towns so frequently seen in Córdoba or Granada . The main attraction of our visit here is the Square de Vazquez de Molina, enclosed by the impressive Palace of the Chains. More wrought iron grating can be seen at the Chapel of Salvador. Renaissance shows through once again in the cute courtyard at the 16 th century Hospital of Santiago , nowadays used as the Town Hall, which features its square belfries. In May there is an extraordinary Music Festival in Jaen with exuberant music for everyone: chamber music, flamenco, jazz, opera, symphony orchestra and of course, corporal movement to all these rythms-dance. Slidding a little further east, we run into the highlight of Jaen. The Cazorla mountain range which holds the Cazorla Natural park, Spain largest. Incredibly extensive, it links the Subbetica mountain to the Sierra Morena and includes the Guadalquivir River source, born as a valley stream in this undamaged wildlife preserve. A vast number of untamed animals, over 90 different kinds of birds nesting, night predators all sharing this wilderness wonderland. A fresh flora is open to us as we go on excursions through this enchanting open air fairyland. You can walk it, horseback ride it, bike it , four wheel drive it and even do it by canoe. Forceful waters are all around us with brooks and streams coming in on all sides. The landscape constantly changes, sometimes heavily populated with pine trees and bushes, others with bare cliffs and abrupt river windings. It is a moving illustaration of life, a never ending illusion, only to be captured ´right then and there´. In the corner of the province of Jaen, between Granada and Cordoba Spain, timidly hidden is the fantastic town of Alcala la Real. During medievaltimes, this town was strategically located and played an important part in leading battles in the 14 th century The 8 th century Moorish Mota castle barely stands but houses a nice museum. The area called El Llanillo is notorious for its historic construction from many different time periods, especially the Abacial Palace built around 1780 clearly exhibiting a Baroque style with French and Italian details. Being as Alcala is the strating point in Andalusian baroque architecture, the traditional hand-made crafts such as leather goods, embroidery and pottery are beautiful and enticing. Almost every month there is something to celebrate so feel free to join in at any time. One celebration which is not to be missed is on August 15 th with over 11,000 heart-warming lit candles paying devotion to the Virgen de los Mercedes. Tasty herring or cod is a specialty dish but spinach Jaen style are appetizing, too. Ajilimojili , a lot harder to pronounce than to eat, is cooked potatoes with red peppers, olive oil and vinegar or vegetable stew made with ripe yellow squash, onions and eggplant. 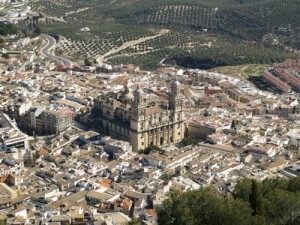 Jaen is a warm feeling in anyway you wish to give sense to this description.